I've seen and done some amazing stuff in my life, but there are only a few things that will always stick in my mind as truly memorable. 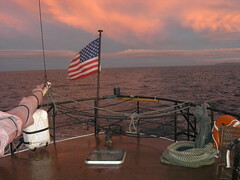 I'd say that steaming along on the Wanderbird has to be one of those memorable times, in a really positive way of course. It's hard to encapsulate that wonderful feeling I experienced while cruising up the coast of Newfoundland with friends. Photographs just do not do it justice at all. This video clip from Wanderbird's wheelhouse, with The Doors playing on Sirius Satellite Radio in the background, goes some way to showing what it was like. This, more than anything, motivates me to get out there with Lady Jane. To say I've had an interesting trip on the Wanderbird would be somewhat of an understatement. The biggest single surprise was the number of whales I got to see. I had always been led to believe that the oceans were pretty much bare when it came to whales, and that we would have to search long and hard to find even one. Not so. 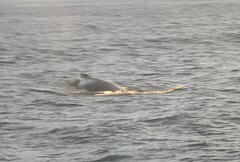 We were no more than fifteen minutes outside of St Johns, Newfoundland, when we saw our first whales, a group of at least three of them. As I had joined the Wanderbird on a section of their voyage travelling directly from St Johns to St Anthony in Newfoundland, with no passengers, we had no time to stop and check out the wildlife. On the passenger voyages Rick and Karen would go out of their way and stop a while. Allowing passengers to experience the whales, and other wildlife, up close. In total, over two days I think we probably saw easily over fifty whales, sometimes only the spray of their 'blow' in the distance and some much closer, including the humpback whale in the picture which followed us for a short while. The best sighting, sadly too far away for my camera, was of a couple of whales playing. We could see them slapping their tails on the surface and breaching over and over again. Quite some sight. I was told that at St Anthony, just a few days earlier, some killer whales had been seen killing and eating a minke whale. This has definitely wet my appetite for more. I'm on my way home, after an amazing week. Saw plenty and met some wonderful people. Lots to tell as soon as I have the time. 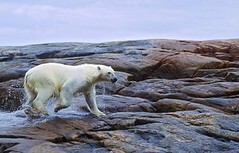 I'm off for a bit, off to "the land of Icebergs and the great white bear". Thanks to a kind invite from Captains Rick and Karen of the Wanderbird, I'm going to join them on a quick trip far up in the Canadian north, along the Newfoundland coast. I am so much looking forward to the wildlife possibilities, land sea and air, the Wanderbird at sea and of course the wonderful company of both Rick and Karen. This will be the first ever proper sea trip I've done, asides for some ferry crossings and a few spins in the Solent. Hope I don't get sea sick (ha ha). For those of you who don't know, the Wanderbird is a similar type of boat to Lady Jane and has exactly the same engine as I have (just a few engine numbers apart). Obviously, after today there is not likely to be any postings until after I get back in a week or so. No doubt there will be some interesting blog entries as a result of this trip. So the cleats are finally made, despite the best efforts of the weather. It's not really about the money, cleats are about ten quid ($20) each on eBay, it's simply the satisfaction of making the things exactly how I want them. 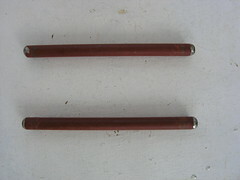 I've already got the bolts to attach the cleats to Willcarry 1, so after a lick of paint they'll be pressed into service. After the Rustroy comes the primer. A first coat at least. Here you see a shot along the port side, showing the progress with the primer so far. 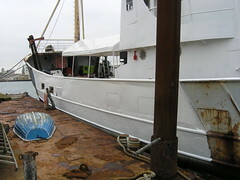 The picture is quite deceptive, as it does not show any of the bow or stern sections which still need cleaning up. Still, it's good to see progress in amongst the inclement weather we have been having. 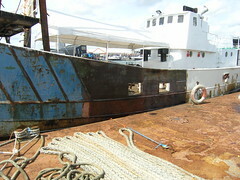 A break in the weather provides an opportunity to rust bust another section on Lady Jane's hull. The black bit, on account of the Rustroy, you can see in the picture has just been done. This task is taking far longer than I was originally thinking, mainly on account of the poor weather we have been having this last few months. It feels like I've now turned some kind of corner though, as I'm starting to look at what's left to do rather than how much there is to do. Oh when will this miserable weather leave us? I had just made a start on cutting steel for the cleats to go onto my new platform when the rain started, forcing me to abandon that job for the rest of the day. Instead, I used up the remainder of the foam from the platform. Insulating more down below, beneath the waterline. Launch day for the new platform! I've decided to call it Willcarry 1, after the aptly named Williams shipping barges. 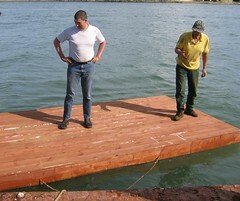 The picture shows Fred (on the right) and myself inspecting the platform immediately after it's launch. Looking at the picture, Fred seems more concerned with his dirty hands than the performance of the new platform underfoot. It's all ended up much more successful that I'd dared hope. The underside of the platform has been filled with two part polyurethane foam from Spray-Insulation, which is why it's so very buoyant. This time I used foam that you simply mix up in a bucket and pour, rather than spray foam. It has the advantage of being much cheaper, and works better for an application like this. After trying the platform out, I'd say it's far superior to the platform I had in Fareham, as it's lighter and more manoeuvrable. This can only make my life easier. Using the rib for power, I can also use the platform as a barge, to bring heavy, or bulky, stuff backwards and forwards between Lady Jane and the shore. 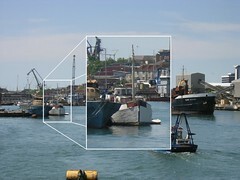 According to Archimedes, the platform is capable of carrying over a tonne. Suddenly now anything's possible. In the longer term, the platform is light enough to swing onto the front deck, so can go with us when we set of on a big adventure. Willcarry 1 can then serve as a swim or dive platform in warmer climes. In the picture I took of the Sand Weaver arriving the other day was a small white boat, called the Abundance. I'm sorry to be told that she has sunk, off of Aldernay. I had noticed the recent painting activity on the boat, and may well have got round to blogging about it at some point, though would prefer it not to have been this particular entry. Regardless of the rights or wrongs of the situation, that's not what this blog is about, it is sad to see someone's hopes and dreams end this way. I sincerely hope I never need rescuing, especially in such sorrowful circumstances. This is also a reminder for me to renew my RNLI membership, a very worthwhile charity. The turbo has been successfully reinstalled. It took a bit of persuading to get in, but things worked out well in the end. 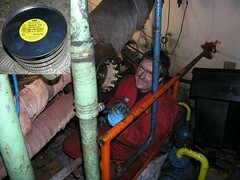 You can see Trevor, of ABB, getting stuck in there fastening up the exhaust side of the turbo. The inset shows one of the tin cans my new turbo bearings arrived in. It seems amazing to me that new bearings should be sealed in tin cans like so much jam. There is definitely something strange about having to use a tin opener in the engine room, though there is no doubt that the bearings are brand new, and that they have not been damaged in transit. 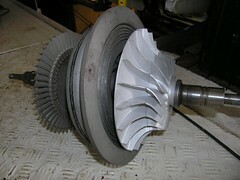 Trevor did a good job of cleaning up the internals of the turbo. 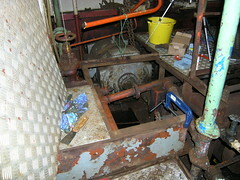 The second picture shows the main shaft of the turbo - to me it looks more like a miniature jet engine part, rather than something out of a rusty old fishing trawler. I will have to wait until I get the right oil into the turbo before I can finally flash up Lady Jane's engine, and see what effect all this work has had. Special thanks to Trevor and ABB for making this all happen. 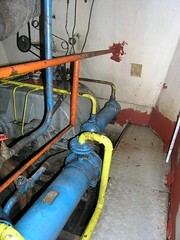 Like some kind of strange disease, the red oxide primer is spreading in the engine room. It's a tedious job, mostly done by Fred, but this preparation for painting in the engine room is nevertheless crucial for a lasting result. I am so looking forward to white paint going onto the walls of the engine room. The place will be so much brighter as a result. There has been little let up in the wet, rainy weather. The engine room benefits though. I've finally got round to working on the task of securing the deck plates. This was abandoned in the rush to leave Fareham. 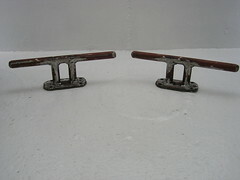 Initially I thought it would simply be a case of banging a couple of screws into the plates. With Lady Jane I should have known better. Here you see the preparation for another deck plate to be screwed down. I've had to lift each plate, clean up around where it seats, in some cases sort out the frame then find suitable places where the new screws can go into the underlying frame. It's no real surprise that it's all taken far longer than originally expected. There are still more plates left to do on another rainy day. 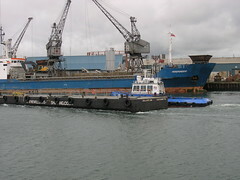 The Williams Shipping tug Wilanne hustles the barge Wilcarry 300 past the Independent, on down the river Itchen. I really like the name Wilcarry. Needless to say, the wet and windy weather again had a big influence on work on Lady Jane this past weekend.